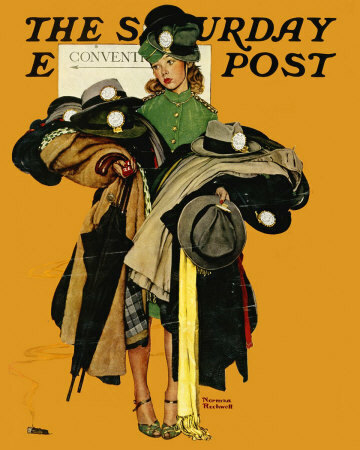 The Convention, a Norman Rockwell painting, appeared on the cover of The Saturday Evening Post published May 3, 1941. This is another favorite of Rockwell collectors, a classic enduring image of the world Rockwell painted. An alternate title for this painting is Hatcheck Girl. This painting was Rockwell's 200th overall out of 322 total paintings that were published on the cover of the Saturday Evening Post. Rockwell's career with the Post spanned 47 years, from his first cover illustration, Boy With Baby Carriage in 1916 to his last, Portrait of John F. Kennedy, in 1963. This was also the second cover for The Post in 1941. In 1941, there were six Norman Rockwell Saturday Evening Post covers published. The original oil on canvas painting, 43 x 34 inches or 109 x 86.5 cm is part of the collection of noted Norman Rockwell collector, George Lucas. It was included in the 2010 exhibit at the Smithsonian Institute's Museum of American Art. The exhibit, Telling Stories: Norman Rockwell from the Collections of George Lucas and Steven Spielberg, showcased fifty-seven major Rockwell paintings and drawings and explored the connections between American culture as depicted in Rockwell's paintings and in the movies. on page 146 of Norman Rockwell, A Definitive Catalogue by Laurie Norton Moffatt. Pristine original copies of this magazine cover routinely sell for big bucks on eBay, when it is offered. And to think it only cost five cents originally! And it was mint condition then, too. In this painting, Norman Rockwell gives us a glimpse into the job of a hat check girl. We can see at least eight hats that she is attempting to carry. One would have to assume that there are at least as many coats. We can also see two umbrellas and at least two scarves. One of her customers has even dropped a cigar on the floor, as seen in the lower left corner of the painting. The coats are all different colors, textures and fabrics. One would have to wonder why all the coats on a day in May. The Convention was only one of 322 Norman Rockwell Saturday Evening Post covers; Here is the list of Norman Rockwell Saturday Evening Post cover illustrations. The weather outside must be rain, possibly a cold front has come through. The expression on her face almost suggests shock and disbelief at how the garments have just been piled on her. After all, two of the hats are piled on top of her own hat! Do You Have A Great Story, Opinion Or Contribution About The Convention?